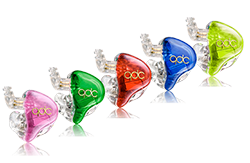 qdc 1LE is specially designed for fashionable music enthusiast. The workmanship is exquisite and luxurious, its shape adopts ergonomic designation to fit different auricle, and takes you the most comfortable wearing. qdc 1LE uses the special customized high end balanced armature which gives very high sensitivity and accurate frequency response.